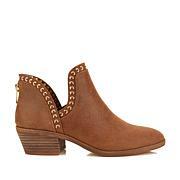 Conquer fashion's new frontier in a western-inspired bootie to wear with your heartland looks. 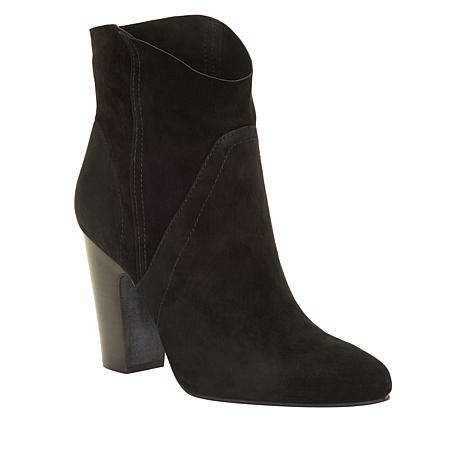 Perfect with everything from jeans to prairie dresses, these pull-on boots are sleek and chic with a lofty (yet totally wearable) heel height. Purchased the black bootie and not overly impressed. I like the height and quality of the suede. Size 7.5 fits very loose. The top portion is much too wide and looks like an unfinished job with raw edges. 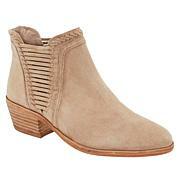 Will be returning the bootie because of the looseness of the fit, the wide top and the raw edges. Thanks HSN - the delivery was very fast.